The cliche is real. India changes you forever. Either because you love it, or you absolutely couldn’t stand it and would never go back. I loved it. So much! Like most things in life that change you, India wasn’t a breeze. I spent 3 months of 2012 in that crazy country, on the back end of a couple of months in Europe. I arrived and left by myself, and my time there was punctuated with many beautiful people, along with a lot of time alone. It was challenging, annoying, suffocating, and nerve-wracking. As a naturopath, I look back to my time in India now, and realise that for a lot of my 3 months there, I was actually living in a mild state of nervous system burnout! (The sheer act of trying to get from A to B each day in India will do that to you – you just never quite know exactly where you’re going to end up!). But, India was also the place where I cemented my resolve and determination to finish my naturopathy studies, and ‘do my thing’ in the world. It was where I became completely, 100% ok with being by myself. It was the country that taught me: I can literally do anything. It was transforming, beautiful, and utterly enriching to my current experience of life. It was the country in which I found the solitude I needed to start to write – my very favourite thing to do! Because of India, I no longer fear stepping out of my comfort zone, and into the unknown. Six weeks after I arrived back in Australia from that trip, I packed up and moved across the country to Sydney, and met my boyfriend, whom I now live in Melbourne with! Life is seriously an adventure. India reinforced my ability to ‘follow my gut’ and make decisions based on my intuition, even when they went against the expectations of others. 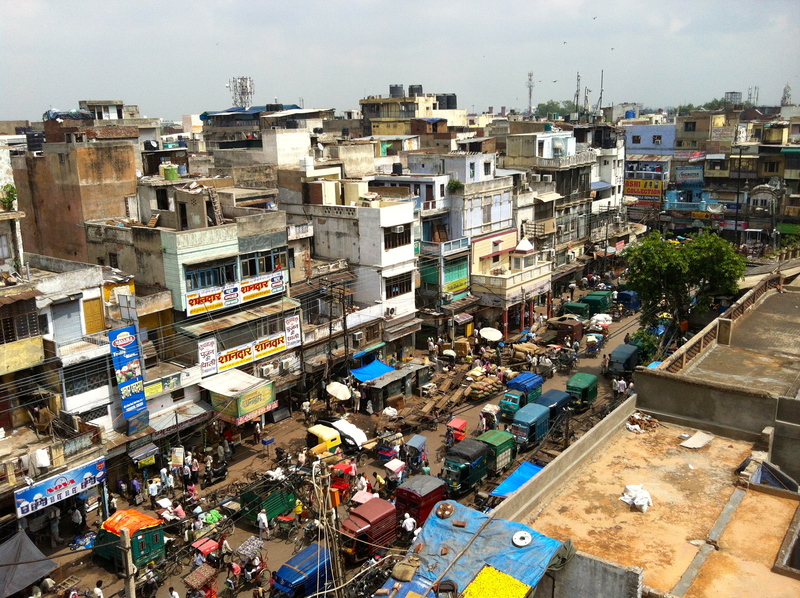 Navigating India on my own for 3 months was, at the time, often intensely frustrating. Like, INTENSELY frustrating. Just like navigating good ‘ol life, can be intensely frustrating, for all of us. But, like all situations in life, when we opt for the discomfort, great things happen. We change in ways that force us to become more authentic, more of who we actually are (as opposed to who we think we should be). When I returned home from that 6 or so months away, I went into a period where I really withdrew from ‘life as I’d known it before I left’. At first, I thought this must have been because I was so overstimulated from my travels. I thought I just needed a lot of down time, more solitude, more time to reflect. A few years on, and I realise that time actually marked a turning point in my life journey. I was stepping into a more solitary role, as I got clear on exactly what I wanted to do with my life, and realised that the way I was living previously, wasn’t going to serve the greater evolution of my dreams – my purpose. So, for that, and for all of the above, I’m extremely grateful that I followed my ‘crazy urge’ to defer my studies and go on that trip. It certainly didn’t make sense at the time, but it felt good. The right choice (for you) doesn’t need to make ‘sense’ (to you, or to anyone else). But, the right choice (based on your intuition) needs to be acted on, because it’s going to be another stepping stone in you moving into who you really are, into owning your purpose in this precious lifetime. India might not draw you at all – this post isn’t really about the country. Its about allowing yourself to act on those dreams you have, that you might be keeping yourself from fulfilling, for whatever reason. EVERY ‘big’ choice in my life has been made without having a clue ‘how’ I was going to get there, ‘how’ I was going to fulfil that choice. But I’ve always found a way. Because when you make that choice, all sorts of things will start to shift in your favour. The universe loves clarity. Just make the choice, and you’ll find that each little step along the way will be tended to. Finally, because I love India SO MUCH: some pictures. This was within 5 hours of arriving in Delhi. I braved the metro to the centre of the city, then jumped in some overpriced rickshaw to escape the madness. 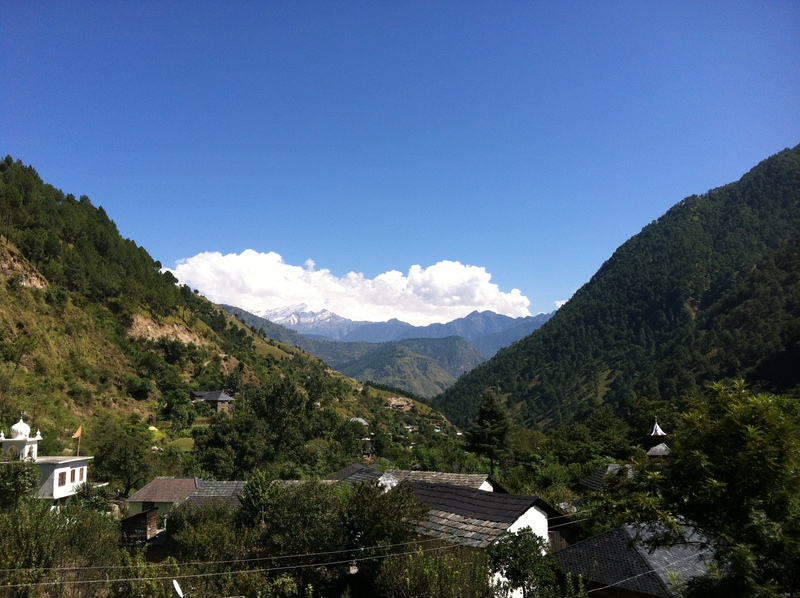 The view from the ashram rooftop in Northern India, where I practiced yoga for 3 weeks, along with 17 other gorgeous women. 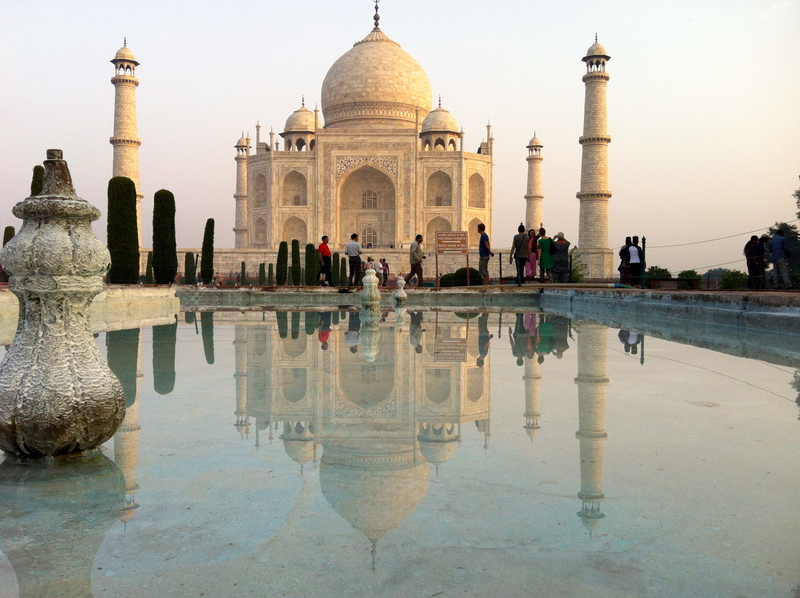 The iconic Taj Mahal – stunning, but overrun with tourists (including me!). 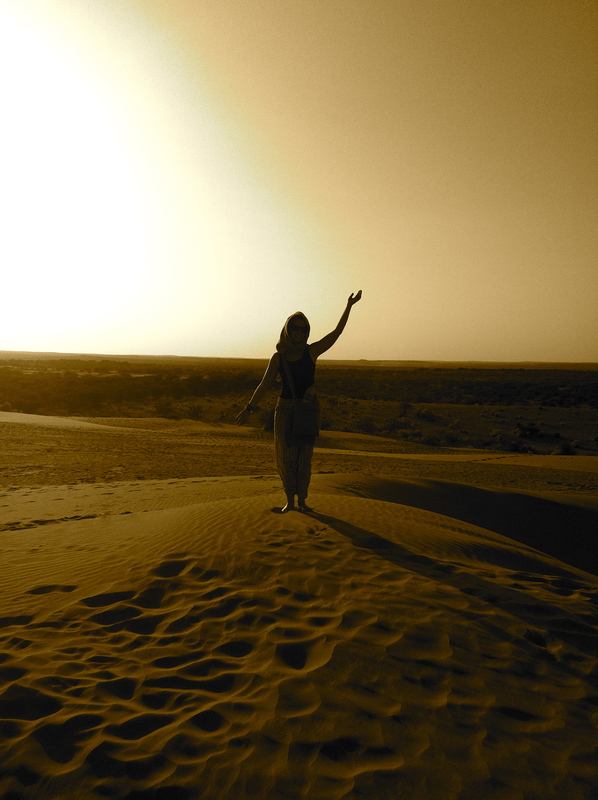 The desert in Rajhastan. I was lucky enough to sleep under the stars (and a full moon!) in the desert that night. Just amazing. 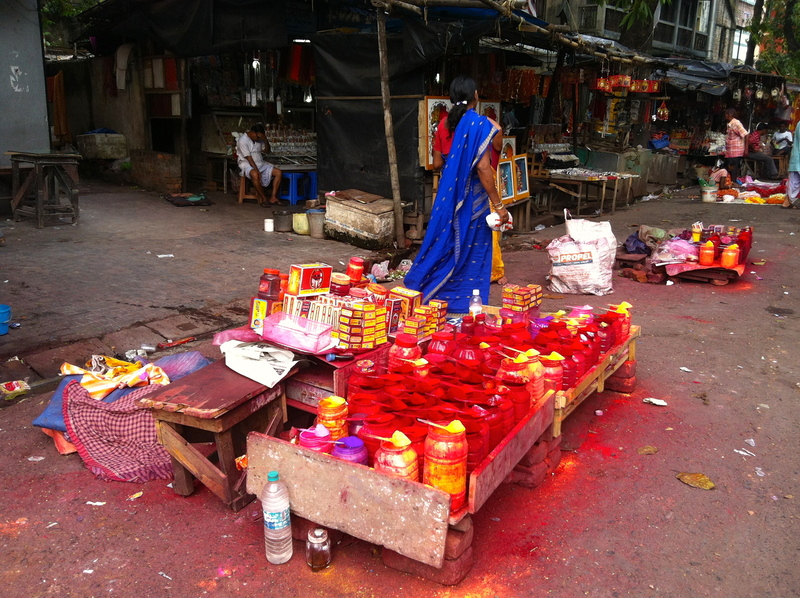 The vivid colours of India, amongst the street markets in Calcutta. 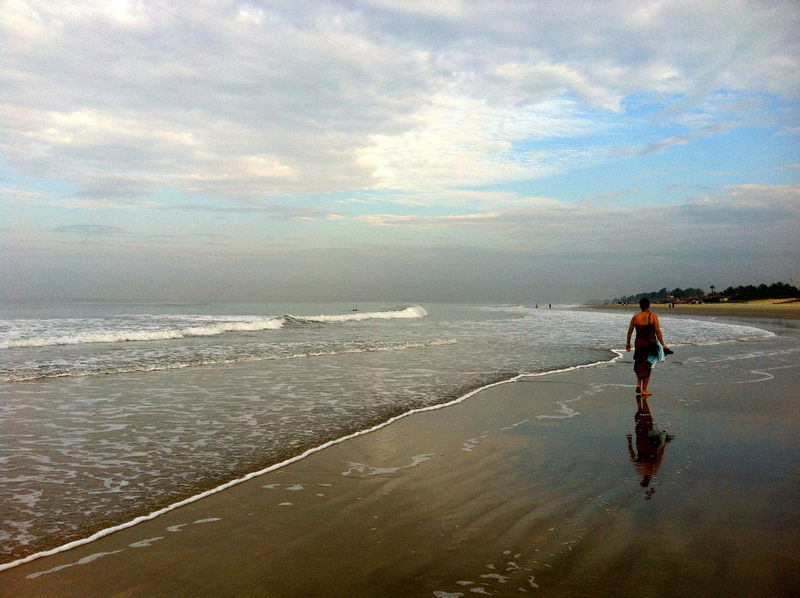 A stunning morning beach walk on my last day in Goa. I absolutely adored this place. I spent my last two weeks here, and it was heavenly to be able to swim in the ocean, after the heat and dirt throughout the rest of India. The ocean was clean and BEAUTIFUL. Forever grateful to this amazing place. If India calls your name, answer! >>> Come on over to find out how you can book your 1:1 Naturopathy + Life Coaching Consultation with me, via Skype. I can help you, wherever you are in the world! // Why I’m not interested in being exhausted anymore.